View More In Handlebars, Headsets & Stems. The Bike Grips You've Been Waiting For! Are you looking for new handlebar grips that will give you great comfort and stability? Do you need an ecofriendly alternative to your old ones that will still be comfy and attractive? Do you want to give your bike a vintage touch of elegance? These natural cork foam bike grips are everything you've been looking for and more! The road bike grips are made with care for maximum performance and durability. Made with natural cork, these handlebar grips are eco-friendly and perfectly safe. Their unique non-slip texture will give you great stability and security. The bicycle grips are also weather resistant so they can stay in top condition all year long. The cork bike grips have an ergonomic design that will make cycling easier and more comfortable than ever. The soft cork material will give you a strong and comfy grip and it will never harm your skin. The cork handlebar grips come in natural brown that is very discreet and can match any style. These grips will look great on your cruiser or fixie for a unique vintage style. The natural handlebar grips have an integrated C-ring clamp that locks on for maximum security. These clamps make the grips very easy to install on your handlebars so you can be all set and ready to go in no time! 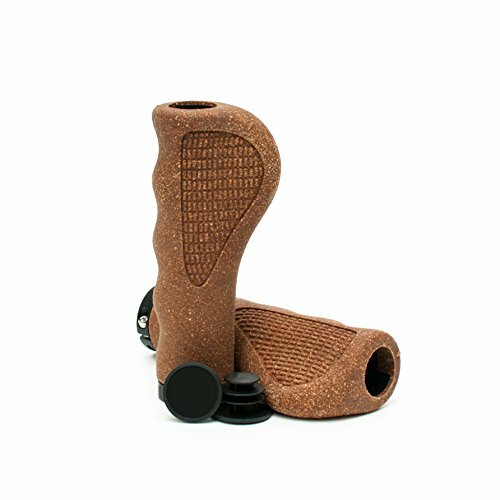 UNIQUE DESIGN: The cork foam bicycle grips come in a natural shade of brown that will look beautiful on every bike. The elegant handlebar grips are great for cruisers, fixies and any other retro-style bike, as they will add a vintage touch and make it look truly unique. These stunning cork grips are great for men, women, girls and boys as they are neutral and discreet yet stylish. ECO-FRIENDLY MATERIAL: These handle bar grips are made with all-natural and ecofriendly materials, so you can rest assured that they are perfectly safe for you and the planet. The natural cork grips are crafted with respect towards the environment and they are biodegradable. ERGONOMIC AND COMFORTABLE: Forget about the sore feeling you get on your hands after cycling for too long. These cork foam bike grips have an ergonomic design and they are very soft, so they can give you a strong and comfortable grip. They are also shock absorbing and super grippy so that your hands will never slip off the handles, for maximum safety and easy use. MADE TO LAST: The eco-friendly foam grips are crafted to perfection with the best quality cork, rubber and aluminum so they can be very strong and durable. The bicycle grips have an air cell structure and they are weather resistant, so they can stay in perfect condition no matter what. EASY TO INSTALL: These bike grips were specially designed to perfectly fit your handlebars and be easy to install. They have an integrated C-ring clamp that makes it very easy to install and gives you maximum security and stability for perfect results. If you have any questions about this product by Asti, contact us by completing and submitting the form below. If you are looking for a specif part number, please include it with your message.